It’s Small Business Saturday, the Saturday after Thanksgiving that is set aside each year to celebrate and support small businesses. We appreciate the love, but we hope that you support small businesses the rest of the year too. Who are small business owners? Your sister, father, cousin, landscaper, handyman, dog groomer, designer, accountant and friend. We live in your neighborhood, vote on local issues and help strengthen the local economy. In honor of Small Business Saturday, we’re giving away a FREE writing guide, The Power of the Pen: 5 Steps to Writing That Produces Results. More people than ever are expected to write today (i.e. blogging, company newsletters, social media), but some people just aren’t comfortable with the written word. We hope this writing guide helps you become more comfortable with your craft and achieve the results you want. Now let’s hit Main Street and support some small businesses today! p.s. Let me know what you think of the writing guide! ^ NASE | * US Small Business Administration | ` Inc.
It’s Small Business Saturday week, one of our favorite times of the year at CCC. Drop in your neighborhood coffee shop for some hot brew, a homemade scone and the latest happenings. Get your car serviced at a local repair shop. Stop in that corner boutique you’ve been eyeing and pick up a nice gift. Let the small businesses in your community know that you support them. I know that my neighborhood wouldn’t be the same without Angel Falls Coffee Company, Capri Pizza or Zack’s Fire & Ice. Who are your favorite mom & pop shops? To maximize participation on this important day, American Express has created the Small Business Saturday map to help you locate where to shop. Are you an AMEX card member? Then register for a $10 credit when you shop small on November 30th. Hurry, registration is limited! Are you a fellow small business owner? Don’t miss out on your chance to participate in this great event. At CCC, we’re celebrating this week by offering you $10 off any new business. Whether you’re looking for a little marketing magic, social media savvy or writing wonder, check out our services. We’d love to help you find your voice and achieve your objectives. Contact us today to discuss your next project! 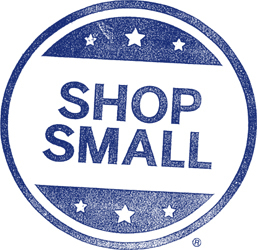 Enjoy the Thanksgiving holiday with your friends and family, and remember to Shop Small this Saturday, November 30th. What small businesses are you planning to support on Small Business Saturday? If you’re a small business owner, feel free to leave a link to any special Small Business Saturday offers you’re running.